Last week (to the date; we went on January 18th), we were meeting a friend/work colleague of Brandon’s for a late lunch. We needed to find something on Colorado Boulevard and we were hoping to try something new, so we decided to try Bruxie. 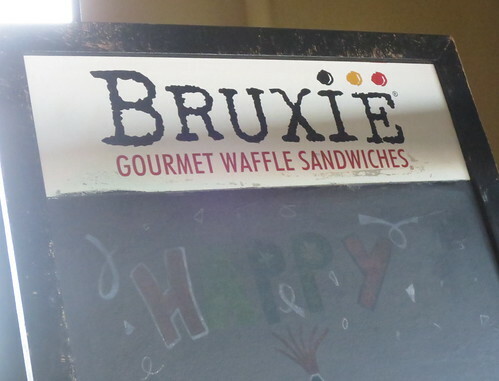 Bruxie is a waffle cafe based out of California, making sandwiches with waffles instead of bread. 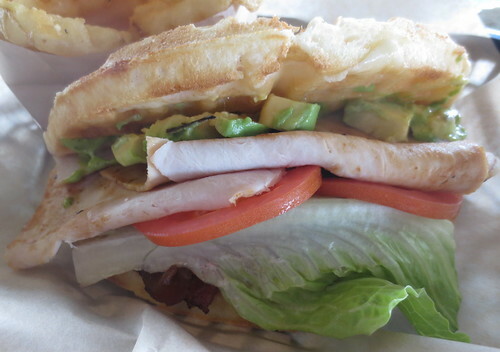 We like waffles and we like sandwiches, so we figured hey, why not? Brandon had their standard chicken and waffles (because hey, why not?) 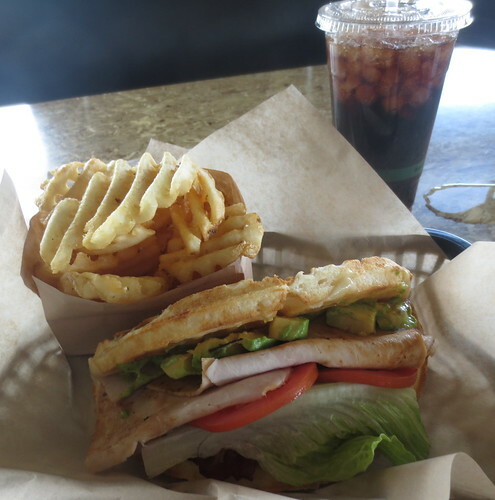 and I had their roasted turkey club – roasted turkey, applewood bacon, gruyere, avocado, tomatoes, romaine lettuce, and pesto aioli. With it came fries and I chose to forgo my typical water for their old-fashioned, artisan-crafted cane sugar sodas (root beer). Brandon tried the orange and it was ORANGE. Almost too orange-y for me, and I like orange soda. The root beer was good – nice and smooth. The sandwich itself was pretty good. I enjoyed it. The fries were okay; I actually prefer Chick-Fil-A’s waffle fries (sorry, Bruxie!). 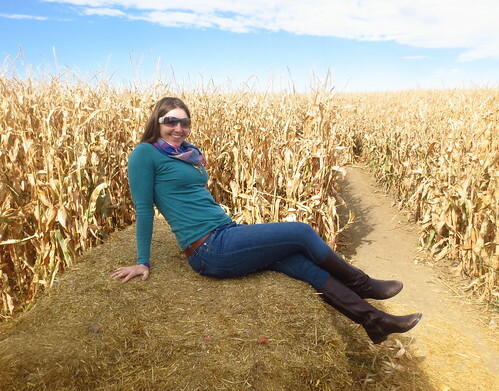 The big question: would I go there again? Probably. It was a decent, affordable lunch option (and we haaaaaate figuring out lunch). *Could* I go there again is the real question – Yelp and comments on Bruxie’s Facebook page are saying that the Colorado location might be closed. If it’s not … try it out. If it is … check it out next time you’re in SoCal? 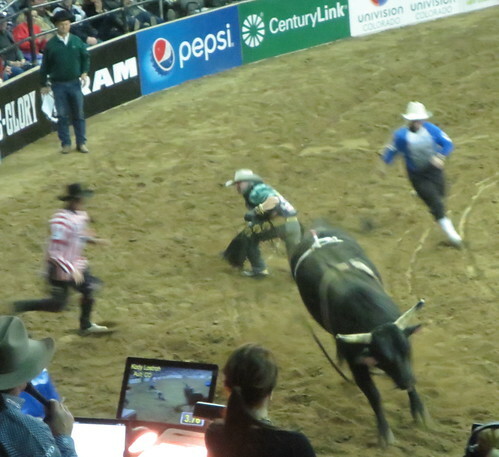 Since we so thoroughly enjoyed ourselves at PBR at the Stock Show last year, we decided to go again this year. 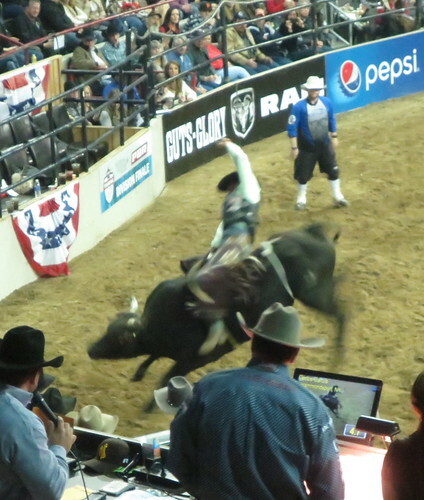 I also learned the lessons of last year and bought better seats. 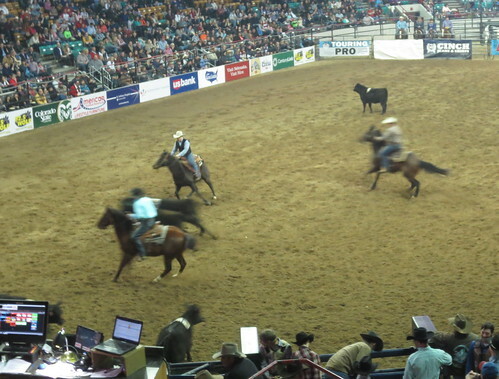 Continuing on with the “learning from history” theme, we also chose NOT to eat at the Stock Show itself, choosing instead to go to the Stockyard Saloon, which is basically on the grounds, but outside the paid admission area. The place is fairly old school – our beers were in cans! – but it wasn’t bad. We both had salads, I had a bacon cheeseburger and Brandon had a steak sandwich. The only thing that truly disappointed both of us was that the cheese on the cheese fries? Melted cheddar grossness. Like cheddar sauce, not actual shredded and THEN melted cheese. Some people like that … not me. I like my cheese not in liquid form. 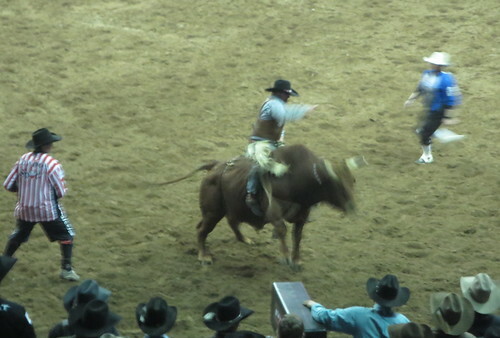 Yes, the bull is bucking even though it doesn’t look like it here. Simple, but oh so complex at the same time. For the triathlon-side of my life, that means a whole hell of a lot of training (and racing, but mostly training as that’s what I’m focusing on this year). For this side of my life (so everything else), it means attempting to embrace positivity. It means de-cluttering my life, both figuratively and literally. 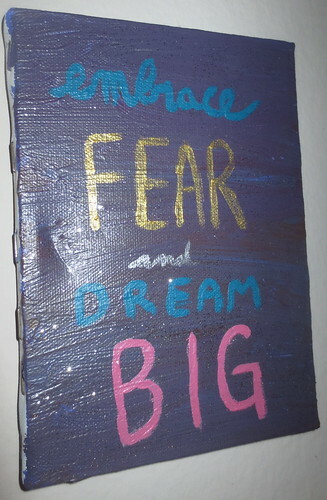 It means attempting to tap back into my creative side. I painted again recently for the first time in a few years and it felt awesome. I also sewed something (that wasn’t mending); I made Brandon a pillow and I forgot how simple, easy and awesome they are to make. It also means attempting to blog more here. Get my voice out. Maybe if I do that, I’ll get out of the job rut that I’ve been in for years. In general, it means fully living life, embracing my fears and realizing that I am worth more than a lot of people think. That I am worth more than what I even think sometimes. I’ve never believed my own hype, the compliments from others. I’ve always downplayed them. I don’t want to go 180 degrees and be a cocky douchenozzle, but if I can get to the point where I can simply say, “thank you, I appreciate it,” I’d be content.